It’s officially been an entire month since baby Stormi came into our lives. That’s right. Kylie Jenner’s daughter was born on February 1st, 2018, meaning that today is her one-month birthday. Kylie infamously kept her baby-to-be secret for the entire nine months of her pregnancy (which is no easy feat when you’re literally an international reality star), only revealing she had given birth via an incredibly sweet YouTube video that documented her pregnancy journey on Super Bowl Sunday (February 4th). 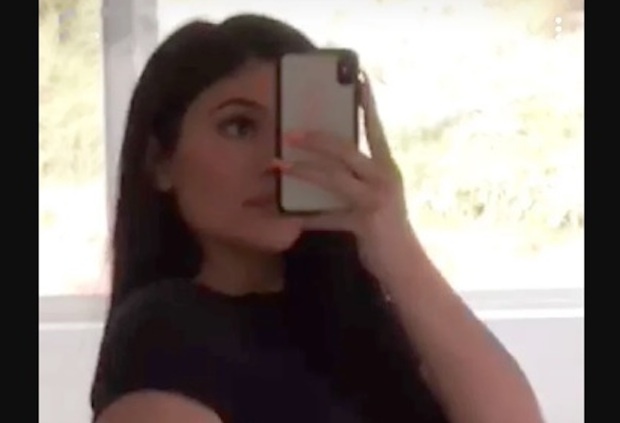 And while we’ve only caught a few mere glimpses of Stormi via Insta posts that revealed her tiny, adorable hand and foot, Kylie just graced us with a stunning selfie — so that’s something. The star is clad in a black thong and midriff-baring black T-shirt, and completed the look with long hair and a pink mani. Kylie captioned the Snap with a simple. "1 monthhhhhhhhh." And even though the star spent nine months out of the public eye, that definitely doesn’t mean she wasn’t keeping busy. In fact, Kylie was hard at work on her latest Weather Collection for Kylie Cosmetics, that includes palettes strongly inspired by her daughter. And as much as we respect Kylie’s decision to keep Stormi out of the spotlight, we’re really hoping she decides to share her with us soon.